There are so many cute back-to-school photos on Facebook today! I enjoy seeing them all, and time really does fly. For example, it seems like just yesterday that Dr. Susie Meade took the lead as the Superintendent of Winterset Schools, but this is the start of her fifth year serving the district. I’m not sure you can really call it “back-to-school” in her case, though, because I know she worked most of the summer. I saw her at several gatherings on summer days and evenings, reaching out to the community to share the current financial status of our schools, predictions for future growth, and the basis of the upcoming vote on September 13th. Dr. Meade (right) made the rounds to many community groups this summer and would be happy to to visit others. 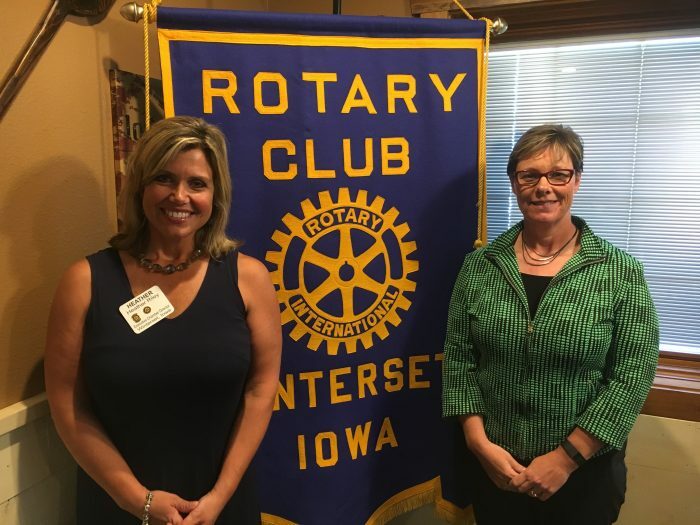 Rotary Club President Heather Riley (left) welcomed her presentation to the club on July 21st. Every spring for the last few years, the school has issued an update on their financial situation. The charts and graphs included here are from that update, and they tell a good story. 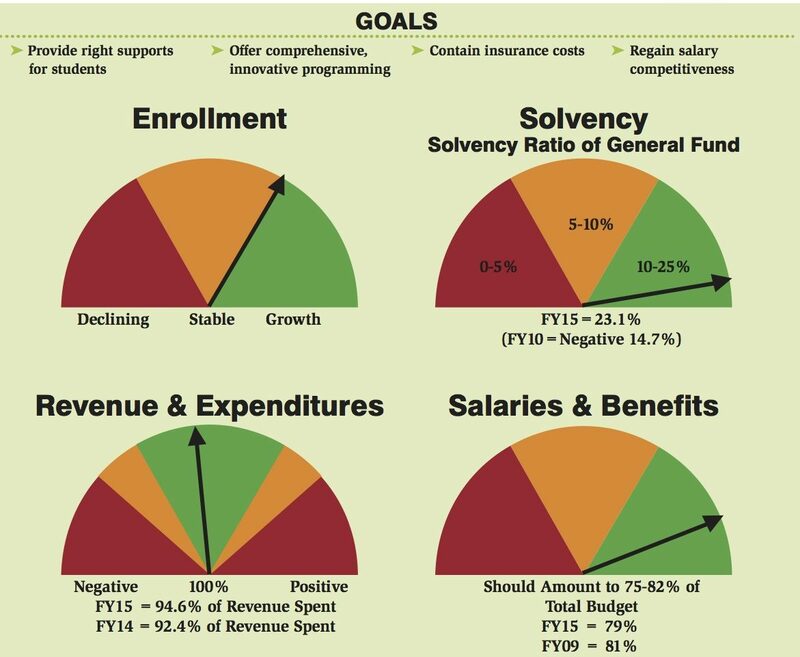 Of the four main goals that exist to make sure they have the right support in place for our students to be competitive with other students throughout Iowa and the nation, all are on target, and the indicators of enrollment, solvency, revenue and expenditures, and salaries and benefits are within the desired ranges. The cash reserve has been built up so that financial obligations could be met without borrowing and paying more interest, and that allows for early payment on bond debt, resulting in savings on interest costs. The management fund has been built up to meet obligations. The passage of the Physical Plant & Equipment Levy allowed existing funds to be reallocated to meet facility needs without using the general fund. Taxes have been reduced by $3.00 since 2011. 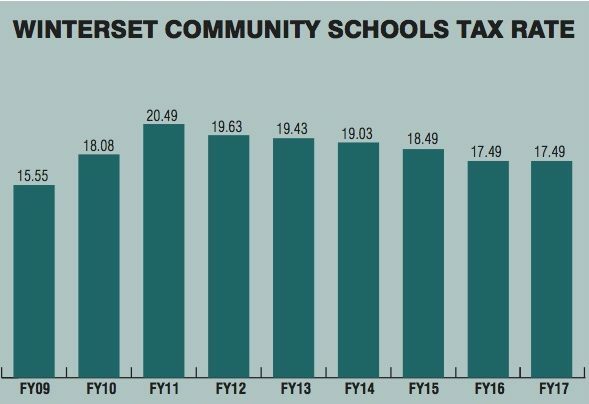 The district has arrived at a tax rate that can likely be maintained and can meet the current and projected needs without much fluctuation (down to $17.49 for the last two years). What’s the September 13th vote about? You may remember that about two years ago, the district went to the community and asked voters for permission to reallocate their existing funds in such a way that they would be able to take care of some major physical projects without raising taxes. That successful YES vote went exactly as promised, and has resulted in improvements (such as the current roofing project going on at the junior high and high school) with no tax increase. In essence, this is a similar request. Basically, they’d like to have the ability to pay off their debt at a rate of $4.05 (per $1,000 of taxable valuation) instead of the $3.20 they’re currently capped at, utilizing the funds they already have. This means no tax increase. The vote is simply to increase the cap from $3.20, which was set in 1992, to $4.05 for debt service. If the district continued to pay off the bonds that were used to build the new middle school at the rate they agreed to at the time, they’d be done in 2029. However, since their financial status has improved in the last couple of years and allowed them the ability to do so, they have started paying off the debt at the previously approved rate of $3.20. 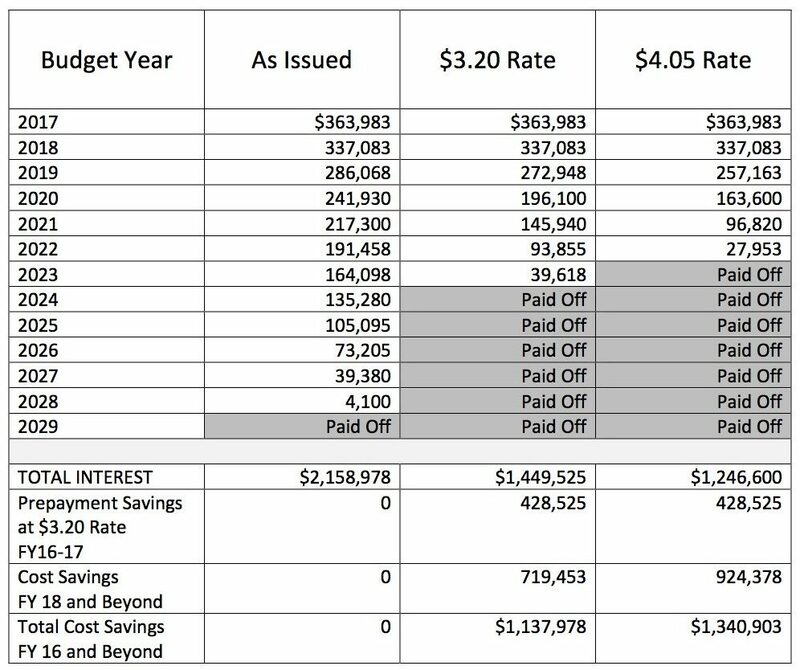 Paying off the bonds at $3.20 is good, and it will allow the district to eliminate the debt six years faster with a savings of $1,137,978. However, $4.05 would be even better, resulting in $1.3 million in savings, possibly as early as 2022. 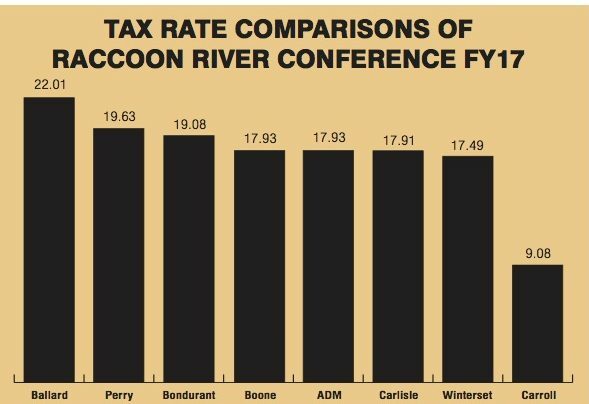 $4.05 is the highest rate allowed in Iowa, and is the rate allowed by all of the other Raccoon River schools. Also, it is important to note that this just gives them the ability to pay at the $4.05 while they can. Currently, the cash reserve is built up to the point where they almost can’t build it anymore, and the management fund is built up as well. If that were to change and they found the $4.05 rate to be a struggle, they could always return to the $3.20 rate or lower. Why is this vote important? A YES vote to increase the debt service levy will not increase school taxes. What it will do is put Winterset in the best possible position to deal with impending growth in the next five to ten years due to expansion in the northeast corridor. Voting day is September 13th. Absentee voting is now open at the Madison County Courthouse and can be accessed Monday through Friday, 8:00 am to 4:30 pm. You can also call to request that a ballot be mailed to you: 515.462.3914.